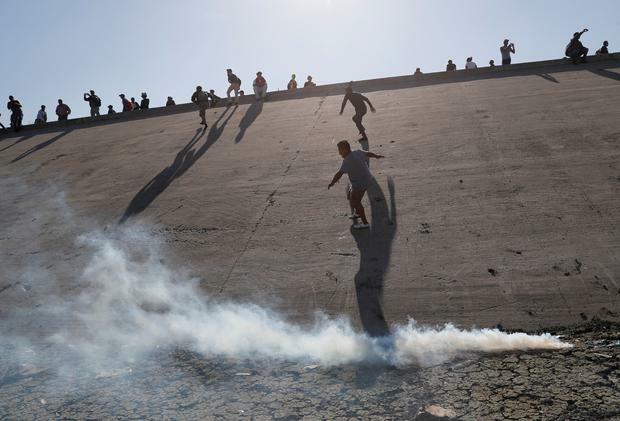 Several hundred Central American migrants have pushed past a blockade of Mexican police standing guard near the international border crossing between Tijuana and California to pressure the US to hear their asylum claims. Mexico's Milenio TV showed images of at least a few of the hundreds of migrants at the border trying to jump over the fence separating the two countries. The migrants carried hand-painted American and Honduran flags and chanted: "We are not criminals, we are international workers." US Border Patrol helicopters flew overhead, while American agents held vigil on foot beyond the wire fence in California. The Border Patrol office in San Diego said via Twitter pedestrian crossings have been suspended at the San Ysidro port of entry at both the east and west facilities. 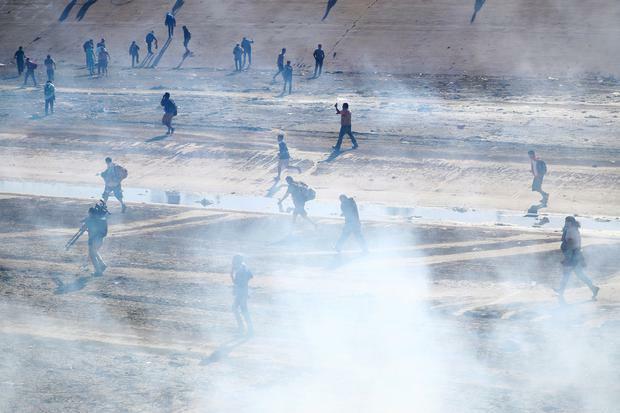 Pictures and video are emerging online of migrants running from tear gas being thrown by the US border patrol near the fence. Many hope to apply for asylum in the US but agents at the San Ysidro entry point are processing fewer than 100 asylum petitions a day. Some of the migrants who went forward on Sunday called on each other to remain peaceful.